I tested the wattage of the Dyson compared with a regular fan, and yes as advertised the Dyson uses less power. It’s reading was 20.5 watts compared with a standard fan which uses 41.1 watts, with the standard fan double that of the Dyson. 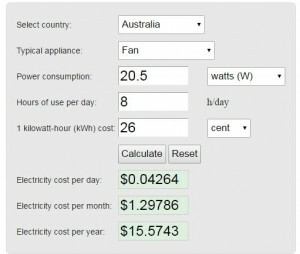 Now I have done some rough calculations and based on 8 hours a day usage the Dyson would cost approximately $15.57 a year, while the standard fan would cost $31.22 a year. 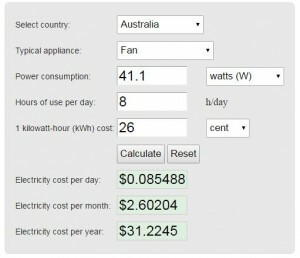 (with the fan on 24 / 7 the yearly cost comparison would be $46.72 and $93.67 respectively). 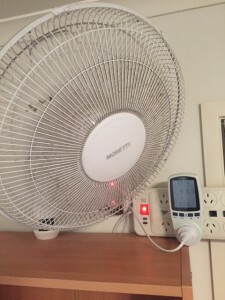 We use these fans in both our home office and our bedrooms, so therefore have a fan on for basically 24 hours a day, with a cost base of $250 per fan, the fan would have paid for itself in savings in 4.25 years. The Dyson is, without a doubt, a much easier fan to clean and looks a lot smarter than a standard bladed fan. A simple wipe around the inside with a cloth and your cleaning is done, compare that to removing the shroud and trying to scrub each blade of a standard fan, the Dyson wins hands down. Comparing to the wall mounted fans, the Dyson does not seem to perform as well. Although having said that the breeze is a more free flowing and more like a natural breeze than with the chopped airflow of a standard bladed fan. If you are looking for a cyclonic winds than the Dyson bladeless is not the fan for you. With the help of a Decibel meter and my iphone, I was able to measure the decibels of the Dyson and the standard fan. At approximately 30cm from the fan the Dyson puts out approximately 70 db’s while the standard fan puts out approximately 90 db’s. Therefore the Dyson comes out the winner in this area also. 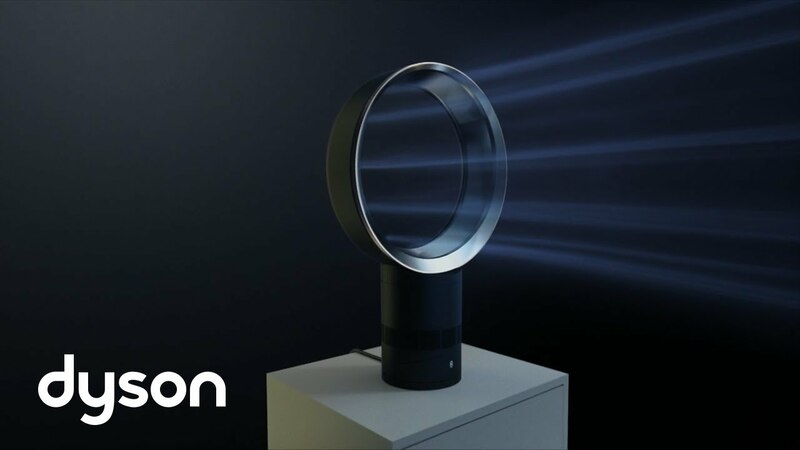 So we know that the Dyson initially costs more than a standard fan but before you can make a fair assessment you have to take into account your purchase price, your expected yearly usage and how long you end up keeping it for. 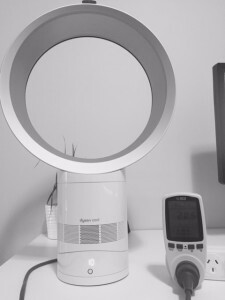 For example if I used these fans 24 / 7 for 5 years the total cost for the Dyson would be $483.60 ($250 purchase price & $46.72 pa) compared with $523.35 ($55 purchase price & $93.67 pa). Here is one for the financial planner in me, with an annual saving of $46.95 and a purchase price of $250 that is a return of 18.78% per annum, much better than the stockmarket.